Tooth whitening has become one of the most popular dental procedures in Michigan. It seems that everyone in Comstock Park is whitening their teeth to help their smiles look younger and brighter. Many consumers in the Rockford MI area are turning to over-the-counter solutions to whiten their teeth; however, there can be risks to this approach. Here is some basic advice on tooth whitening that Dr. Bruce Stewart and Dr. Eric Hull would like to share with you. Tooth whitening is not for everyone, and depends on your dental history. We encourage you to visit our office in Comstock Park prior to starting a tooth whitening system for a thorough evaluation of your teeth and gums. Dr. Stewart and Dr. Hull can help you determine whether your teeth can be whitened safely and effectively. We can also recommend teeth whitening solutions that will work best for you. Stewart & Hull is a good place to start for this important decision. 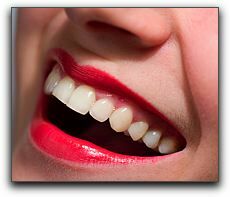 There are many dangers to be aware of when whitening your teeth. Over-the-counter teeth whitening products available in the Comstock Park area will provide varying degrees of effectiveness on your teeth. If used improperly, tooth whitening solutions can cause problems including tooth sensitivity, over whitening, damage to your tooth enamel, and irregular coloration. Whitening too much can even have a reverse effect, making your teeth look gray. Most tooth whitening product manufacturers recommend that you visit your local Comstock Park dentist when things go wrong with your over-the-counter tooth whitening solution. Our office is located at 769 York Creek Dr NW, Comstock Park, Michigan 49321. Please call or stop by to make an appointment to discuss your tooth whitening options. We are eager to help you make the best decision for your smile.Our staff is available to discuss tooth whitening solutions, explain tooth whitening options, and check your teeth to make sure you will get the tooth whitening results you want. We look forward to seeing your beautiful bright smile. —Dr. Bruce Stewart & Dr. Eric Hull, tooth whitening for the Comstock Park community. Please call us at 616-827-7019. Cavity Fighting Chewing Gum For Our Comstock Park Patients?